The Pitohui (pronounced like spitting: pittoeey) is one of New Guinea's most widely spread birds. It is, in fact, the only known genus of poisonous bird in the world. At least three species of pitohui have a strong poison in their skin and feathers, the Hooded and Variable Pitohui being the deadliest of the three. The poisonous properties of this bird were not recorded until 1989. Jack Dumbacher, who was netting birds in New Guinea, caught a Hooded Pitohui and in untangling it from his net, got scratched and bit. But it was a small bird, and not a big threat, right? Wrong. Dumbacher put a cut finger in his mouth and his lips and tongue went numb. While that was the extent of his reaction, it caused a much more significant one in the scientific community. Currently six species are classified in the genus, though current molecular genetics research suggests that significant reclassification of the Pachycephalidae may be needed. Black Pitohui, Pitohui nigrescens: The Black Pitohui is found in Indonesia and Papua New Guinea. Crested Pitohui, Pitohui cristatus: The Crested Pitohui is found in Indonesia and Papua New Guinea. 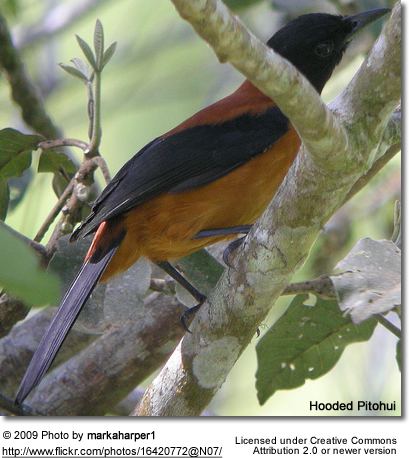 Hooded Pitohui, Pitohui dichrous: Widespread throughout New Guinea. Variable Pitohui, Pitohui kirhocephalus: The Variable Pitohui is found in Indonesia and Papua New Guinea. White-bellied Pitohui, Pitohui incertus: The White-bellied Pitohui is found in Indonesia and Papua New Guinea. Pitohuis are generally about 23 centimetres long with strong legs and a powerful beak. They are brightly feathered in red and black warning colors, much the same as the frogs. The Hooded appears to be the most dangerous, with the Variable being of medium toxicity and the Brown Pitohui the least harmful. The Hooded Pitohui is brightly colored, with a brick red belly and a jet black head. The Variable Pitohui, as its name implies, exists in many different forms, and twenty subspecies with different plumage patterns have been named. Two of them, however, closely resemble the Hooded Pitohui.